If you have a mini dog, the Carlson Mini Pet Gate is perfect. 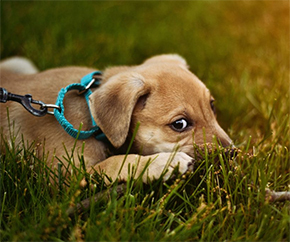 The gate is a convenient, chew-proof way to contain and protect both your pet and your home. Made of an all- steel construction and standing just 18” high, the gate is designed to easily step over. To quickly contain your dogs, our mini gate features a pressure-mount system with adjustable tension knobs. The expandable nature of the gate fits openings between 27"-31” and includes a 10” x 7” pet door, so small animals can easily pass through without having to take the gate down. For small pets that need to be contained to a specific area, the Carlson Mini Pet Gate is a perfect choice. 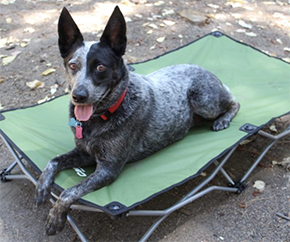 The all-steel constructed dog gate flawlessly blends functionality with convenience. A highlight of the gate is the ease of installation. It securely sets up in merely minutes. Each of the four pressure mounts can be adjusted to create a stable and secure fit. If you’d prefer to hardware mount, the included wall cups will help you attach it to the wall. To allow you to use the Mini Gate in multiple areas of your home, the gate is easily expandable to fit a range of door or hallway openings between 27"-31"”. Add the included 4" extensions and the gate expands to fit doorways between 27"-31"”. Standing just 18” tall, the Mini Pet Gate with Small Pet Door is the perfect height for keeping small dogs contained, while allowing you to easily step over the gate. 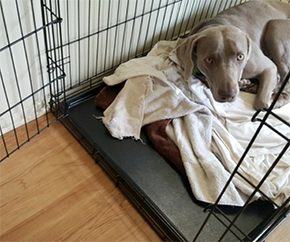 With the addition of the 10” x 7” small pet door, your pooch can pass through easily too without taking the gate down every time. When you need to take your gate down, the Carlson Mini Pet Gate with Small Pet Door is lightweight, compact, portable, and stows flat – making it easy to shove in your closet before guests arrive or pack along when traveling with your pets. The Carlson Mini Pet Gate with Small Pet Door is backed by a manufacturer’s limited 90-day warranty. Carlson’s gates are designed specifically for your pet. Instead of repurposing baby gates, Carlson has created a quality solution that suits all breeds and lifestyles.